If you have been following my writing for a while now then you know that I am a total comic book junkie (cooooomiiiiicsss). Give me a cup of coffee and a pile of comics and I will be one happy happy lady. Thanks to Comixology’s kickass werewolf section I have been getting a constant dose of werewolf comics (yay!) 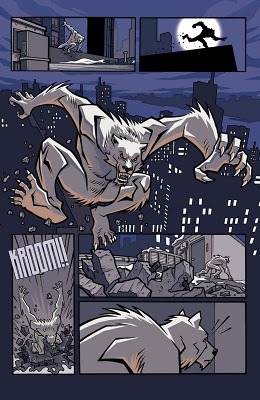 and my most recent comic book adventure was The Astounding Wolf-Man Issue #1. I LOVED the artwork in The Astounding Wolf-Man! I have seen the art style before, but not in a comic and not done as well as Howard did it. It was a pleasant surprise for sure. I also absolutely loved the werewolf design in this comic (as you can see in the picture to the right), it is the perfect combination of man and beast. Overall I was super pleased with the art – it was colorful, visually appealing and fit the feel of the comic very well. The story of The Astounding Wolf-Man has a wonderfully nostalgic feel to it. It brings those classic superhero comics to mind, but doesn’t mimic them. This story is a modern day superhero werewolf tale. You have a family man turned powerful beast and a mysterious supernatural mentor appearing to tutor him. Totally has that old comic vibe. I really enjoyed it and can’t wait to see where the story goes from here. Clearly, I really loved The Astounding Wolf-Man and can’t wait to check out the next issue. To check out Issue #1 for FREE head over here. Have any of you read The Astounding Wolf-Man? If so, what did you think? What Do You Think of True Blood?